I presented this senior history thesis before the Midwest regional meeting of Phi Alpha Theta (the International History Honors society) in March of 1997. Charles Maurice de Talleyrand-Perigord was a unique individual. Possessed of extreme self-confidence that some called arrogance, he became one of the most important diplomats in Europe during the late 18th and early 19th century. Talleyrand, through skill, cunning and plain luck, managed to survive the reign of Louis XVI, the revolution and reign of terror, the Directory, the rule of Napoleon, and the reigns of both Louis XVIII and Louis Philippe. Talleyrand seemed to possess an uncanny ability to foresee political events and place himself on the side of the victor. At the Congress of Vienna, in 1814, Talleyrand fought to re-establish France as a political power equal to any other in Europe. His weapons were not the tyranny and violence used by Napoleon, but the principles of legitimacy, justice, and public law. Talleyrand left the college at age 21 and was elected by the province of Rheims to be a member of the Assembly of the clergy. In 1780 he was appointed as agent-general of the clergy. This position made him the clergy's representative to the Crown. He realized the importance of widening his contacts and surrounded himself with those he thought could further his career. He began writing letters to many diplomats in the foreign service. In 1789, he was appointed the Bishop of Autun. Talleyrand saw some hope in the ideas of the Revolution. He had authored the sixth of the twenty-two articles in the Declaration of the Rights of Man. (3) Talleyrand had proposed the nationalization of the Church. This, he stated, is the reason he eventually resigned as Bishop. He acquainted himself to Comte Paul de Barras, a member of the Directory. This proved useful when, in 1797, the cabinet was completely modified. Talleyrand was named Minister of Foreign Relations. Again he found himself serving in a government position. Talleyrand was suspected of complicity in the coup of 18 Brumiare, a charge he vehemently denied. However within two weeks of the coup, he was appointed as Napoleon's Foreign Minister. Talleyrand often disagreed with Napoleon's foreign policy. He tried to counsel a policy of moderation for he did not consider the Europe organized by Napoleon as one that could ever attain a stable peace. Napoleon's Europe was to be based on coercion and violence. The terms of the Treaty of Paris were incredibly lenient. France would be returned to her boundaries of 1792 with the addition of 150 square miles of surrounding territory. The art treasures that Napoleon's troops had looted from other European nations, would remain in Paris, to prevent their being damaged. There would be no demands for reparation payments. The leniency shown by the Allies was purely political. Above all else what they needed for Europe was peace and security, and to impose a harsh settlement upon France would only weaken Louis' position and lead to a possible revival of Bonapartist sentiment. The Allies did what was necessary to prevent further hostilities with France. Talleyrand entered into the conferences at Vienna, with the intention of driving a wedge between the powers and preserving for France, not only her dignity, but her place among the other great Powers of Europe. He believed that although France had escaped destruction, by the treaty of Paris, she had not resumed her rightful position in the system of general politics in Europe. Her former possessions would be divided between the powers who had defeated her, excluding France, and reducing her to the status of a secondary power. To prevent this Talleyrand requested that Louis XVIII make him the delegate to the Congress. (8) He considered this his duty. Whether he truly believed this was France's duty, or if he could see that by allying France with the smaller nations it would give his nation greater power in the Congress, is a matter for debate. His methods proved effective and France would be heard. He also began to press for the opening of the Congress. On September 30 he received an invitation to a conference at the office of Prince Metternich, the representative of Austria. The minister of Spain, Count de Labrador was also to be in attendance. This was to be a preliminary meeting of the plenipotentiaries. At this meeting the proposals made by the Four powers would be presented. Talleyrand and Labrador were given the protocol that had been decided upon by the four Powers. Talleyrand immediately questioned why he alone, of the French delegation, was there. He was told that only the head of each Cabinet had been invited. Talleyrand replied that Labrador of Spain and Humboldt, who had accompanied the Prussian representative, were not the head of any Cabinets. He was assured that Labrador was attending only because the Spanish Secretary of State was not in Vienna. Humboldt was there because Prince Hardenberg was deaf. Talleyrand replied," we all have our infirmities and can exploit them when necessary. "(11) He had scored a point, there had been no concession made to accommodate his disability. The other representatives agreed that in the future, two delegates from each country would be allowed at the meetings. Talleyrand was told that this term was used for the sake of brevity and was not meant to suggest anything sinister. "Brevity," he replied, "should not be purchased at the price of accuracy. "(13) He argued that the Quadruple Alliance meant nothing. Its power hadended with the signing of the Treaty of Paris. The treaty clearly stated that all the powers who had fought on either side were to gather at Vienna and settle in a general congress the arrangements to complete provisions made in the Treaty. Talleyrand pointed out that the Four powers had no legal, logical or moral justification for assuming control. They had agreed to calla Congress of all the powers. Talleyrand refused to recognize the authority of this group to make any proposals to the Congress. He did not intend to agree to anything arranged without France. Talleyrand declared that any agreement reached before the Congress met would be ignored. This embarrassed the representatives. Their reply was that it meant nothing and would be withdrawn. Labrador shared Talleyrand's sentiments, Spain's interests were not considered. He asked, " If it means so little, why did you sign it? "(14) To this question there was no answer. The protocol was set aside. Talleyrand, with the aid of the Spanish delegate, had gained a small victory. He was now prepared for a larger battle. Talleyrand had succeeded in reducing, to a degree, the control that the victors had given themselves. He wanted to further undermine this authority and place France in an equal position of power with the rest of Europe. Metternich produced a document for Talleyrand and Labrador to sign, along with the other four delegations. It would divide the work of the Congress into committees. The countries could then address their problems to the proper committee and it would be that organization who would propose a solution to the Congress as a whole. Talleyrand was suspicious of this proposal. It would grant France, and Spain as well, a voice in the decisions of the Congress, but even if France and Spain always agreed they could still be overruled four votes to two. This still allowed the Four control of the Congress. He asked for time to consider, as this document was new, and it was necessary to determine whether " it was compatible with the rights that we are all bent on respecting."(15) . Talleyrand went on to question why the Powers wanted those things that should be decided by the Congress, arranged before the body had even met, should not the rights this document gave them have been granted to them by the Congress? He called for the Congress to be assembled to decide the matter. A general discussion followed, with each delegation expressing reasons why this was not possible. Someone mentioned the problem of the Kingdom of Naples. The fact that he had expressed in a public document something that had been discussed in private, angered the delegates from the Four powers. This action forced them to allow delegates from all the signatories of the treaty. If the lesser nations were not included they would be forced to explain to all Europe the reasons. Talleyrand's objections may seem trivial, yet they were important concessions. He had been meeting with the ministers of the smaller countries, and already had the support of Spain. (18) With the support of the lesser nations, France could control any voting in the Congress. This was an obvious attempt by Talleyrand to exclude Murat. His sovereignty was not un-contested. Talleyrand wished to see the throne of Naples returned to the Bourbons, who had formerly held it. If accepted, this proposal would allow the King of Saxony, for he had retained his throne by siding with Napoleon. Talleyrand wanted to prevent a Prussian expansion and hoped to use Saxony to block this expansion. Talleyrand told the Four that he wanted nothing for France, but that he brought them the sacred principle of legitimacy. This meeting adjourned without any agreement being met. When the meeting opened later that evening, Metternich read two proposals. One of the proposals had been drawn up by Metternich himself, the other was Talleyrand's. Most of the members agreed to the Metternich suggestions. Talleyrand's, they argued, was too prejudicial. Talleyrand said of Metternich's proposal, "It merely set the opening of the congress for November 1 and proposed for business in the meantime to be by means of confidential communications between the different powers. "(21) Talleyrand agreed to the Metternich proposal only after a long heated debate and an agreement to add that the propositions made at the congress should conform to public law. Talleyrand had gained a victory. He had forced them to deal with the issues of legitimacy and self-interest. Their decisions would have to be based on principle and legitimate sovereignty. Talleyrand had decided long before the Congress met to push for the issue of legitimate sovereignty. In his Instructions he clearly explained his reasons. First he declared that sovereignty could not be lost by conquest, nor could it be transferred except by the willing secession of its sovereign. The sovereign, by conquest, lost only actual possession of his estate. (24) Using this reasoning most of the nations conquered by Napoleon never lost their sovereignty. These nations would have to be returned to their legitimate rulers. Second, those countries whose rulers had disappeared or had ceded their sovereignty to France, were now without legitimate rulers. They had transferred their sovereignty to France. Because of the Treaty of Paris, France had ceded sovereignty over these nations, but had not transferred it to anyone else. This left one half of the countries in Europe with no legitimate rulers. Third, the Allies had no power to create legitimacy for these nations, because as conquerors of the French Empire they did not gain sovereignty over them. This would have to be decided by the entire Congress, acting together, in order for any appointed ruler to be recognized as sovereign. Unfortunately Metternich's plan for confidential communications proved a failure. Talleyrand and France still faced isolation from the Four powers. They met in private at balls and entertainments given in their honor. Talleyrand was powerless to prevent this. No one, however, had considered Alexander's inflexibility on the question of Poland or Talleyrand's skill to turn events to his favor. Alexander was unmoveable on the idea of Russian control of Poland. This was opposed by England, who wished to uphold a treaty that would have divided the Duchy of Warsaw between Prussia, Austria and Russia. (25) Prussia was willing to allow the Russian expansion if, in compensation, it received Saxony and Mainz. Austria, in order to sway Prussia to its side, would allow immediate Prussian occupation of Saxony, provided Prussia would join England and Austria in opposing Alexander's design on Poland. This proved to be a stalemate and no agreement seemed forthcoming. Rumors of war between Austria and Russia began to circulate. As these threats of war began to reach the rest of Europe, Talleyrand began a campaign to sway opinion in France's favor. By the end of October, Talleyrand had managed to sway public opinion in favor of France and away from the allied Powers.The confidential communications between the Powers had led to a stalemate. France, who had been excluded, was the only one to benefit from them. The Four would have to find another system if any real progress was to be made. On October 30, 1814, a conference of the eight signatories was called. Talleyrand submitted a proposal for the procedures to be followed by the Congress. (27) It called for a directing committee made up of representatives of all the sovereigns and a papal representative. This committee would then appoint four subcommittees that would deal with the problems of Italy, Poland, Switzerland, and Saxony. Talleyrand, in this proposal had even included a compromise that would allow Murat to be represented as well as the King of Saxony, but they would have no vote. Once these subcommittees had finished their work, the whole Congress would be convened to approve or reject their recommendations. Talleyrand's proposal was rejected. The confidential communications would be continued, but Talleyrand would be included. The allies had learned it was unwise to exclude him.On November 5, 1814, Talleyrand met with Metternich, Castlereagh, and Nestlerode, the Russian ambassador. Their discussion centered on the problem of Italy. Various solutions were proposed but the main problem remained Murat and his sovereignty in Naples. Talleyrand proposed that they deal with Italy in geographic order, from North to South, beginning with Sardinia. He suggested a way that the claims of sovereignty could be honored. This he hoped would lead to an overthrow of Murat. Alexander, upon learning of Talleyrand's inclusion in the conference, hurriedly invited Frederick William to dine with him. Prince von Hardenberg was summoned later that evening and told to make the other plenipotentiaries aware of an unshakable agreement between Russia and Prussia over the question of Poland. This agreement both alarmed and angered Metternich, and Castlereagh. Metternich was now determined to protect Saxony. Some months before, Talleyrand had tried to obtain an ally among the Four powers in actively opposing Alexander's plans for Poland. He had turned to Castlereagh. England, like France, had no territorial demands to make, and both countries wanted a general balance of power on the Continent. However, if England made too open a gesture toward France it would cause repercussions when the Congress met. Castlereagh met with Talleyrand and King Louis XVIII in Paris in August of 1814. Castlereagh was en route to Vienna for preliminary meetings with the other three Powers. France offered its support to England in preventing Russian plans for Poland. Castlereagh had, in turn, given his assurance that nothing detrimental to France would be done during this meeting(29) . A special understanding was formed between England and France. This understanding would now become useful. Considering Alexander's refusal to abide by the partition of Poland agreed to by treaty,Talleyrand secured an agreement between Austria, England and France. This was to be an alliance of mutual support. Austria and France each promised to provide 15,000 men and Great Britain would furnish and equal number of men of a proportionate subsidy. Hannover, Sardinia, Bavaria, and Hesse-Darmstadt would be invited to sign the treaty as well. A military commission would be established to prepare joint plans if Russian armies advanced into Western Europe. This treaty was signed by Talleyrand, Castlereagh, and Metternich on January 3, 1815. (30) With the securing of this treaty, Talleyrand had hastened the dissolution of the Allies against France. Yet the question remains: How much of this was due to Talleyrand and how much to the differences of the Allies themselves? Talleyrand was able to exploit their differences to the benefit of France, but weren't they responsible for the breaking apart of the Alliance? They had joined originally to defeat Napoleon, and now with the lack of a common enemy, they were testing the restraints of the Alliance to its breaking point. With the dissolution of the coalition against France, Talleyrand had achieved a major victory, yet the problem of Poland remained to be solved. Talleyrand, in his Instructions, had proposed the idea of a large, independent Poland, one who was strong enough to maintain its independence. He also saw no need for undue compensations to Austria or Prussia as Russia, also, would be required to make a compromise and give up some of its desired territory. Talleyrand was realistic enough, however, to realize that this would not occur. Russia, and Alexander particularly, would never allow Poland any real independence. The only solution that remained was to return Poland to its situation after the last of the three partitions. Talleyrand also tried to warn Austria of the danger of putting, "Russia like a belt around your most important possessions in Hungary and Bohemia. "(31) He also warned of allowing Saxony to be taken over by Austria's "natural enemy". Talleyrand, as did most of Europe, knew of Prussia's well-trained army and militaristic sentiments. He feared that with the enlargement of her sphere of influence, Prussia could become dangerous to her neighbors. Talleyrand suggested preventing this by the formation of a German federation. After a period of threats and concerns about outright war, an agreement was finally reached on February 11. The division of Poland would be that Prussia gained the province of Posen, Austria would retain Galacia, Krakow would be declared a free city, and the remainder would be formed into the Kingdom of Poland under Russian control. Prussia, in compensation for its loss of Polish territory would be given two-fifths of Saxony with the rest being restored to its legitimate sovereign. Prussia also gained the fortresses of the Elbe, much of the left bank of the Rhein, Westphalia and Pomerania. Austria, by way of compensation, obtained the Tyrol and Salzburg. She was promised further territory in Italy and the Illyrian provinces on the Adriatic. This was not the solution Talleyrand had wanted, but it had prevented another war. Still to be decided was the question of Murat and Naples. Talleyrand stood firm. Naples must be returned to its legitimate sovereign. This caused a problem for Austria and England. Although now allied to France, both were bound by treaty to support Murat's claim to Naples. Austria, in January of 1814, had signed a treaty that guaranteed Murat the throne and increasing his territory. In return for this guarantee, he had sent 30,000 troops to aid Austria. To further complicate matters, England had recognized the validity of this treaty five days after its signing. Metternich and Castlereagh could hardly advise their governments to ignore the treaty only to satisfy France's demands. By February of 1815, it looked as if the problems in this area would solve themselves. Austria suspected Murat's influence in the unrest now being seen in Northern [Austrian] Italy. Metternich had begun to realize that Murat would always be a problem for them and Europe. Metternich began to send letters concerning the problems with Murat to Count de Blacas, Louis XVIII's favorite, in Paris. (32) England, too, began to doubt the wisdom of its support of Murat. Their control of the Mediterranean was in danger. Before the Powers could act, however, another powerful force stepped in that would aid Talleyrand in his quest to have Murat removed from the throne of Naples. Napoleon had escaped from Elba and was on his way back to reclaim his throne. On March 10,1815, Napoleon had reached Lyons and was welcomed with open arms. In ten days time Napoleon had reached Paris and was again being hailed with shouts of "Vive l'emperueur". Louis had fled to Ghent, and the Congress was pledging whatever support was necessary to repel the tyrant. The Congress was stirred to action and by March 22, Switzerland was given new borders and was declared permanently neutral. This became a principle of international law. An agreement for the embryo of a German confederation was also reached. These two developments pleased Talleyrand greatly. Switzerland's neutrality gave France a secure frontier and the German Federation, Talleyrand believed, would become an important element in the equilibrium of Europe. Although the settlements of Switzerland and Germany were important to France, Talleyrand's concern was still with Naples. In January of 1815, Metternich, wishing to use the question of Naples to secure Austrian aims in Italy, began negotiations with Louis XVIII. 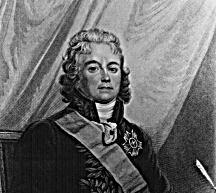 Unknown to Talleyrand, Metternich made a secret agreement with the French King through the Compte de Blacas. The agreement called for Austria to expel Murat in exchange for concessions by Louis. These concessions, which included no liberal constitution for Naples, would, of course be in Austria's favor. (33) While the negotiation had excluded Talleyrand, it still guaranteed him what he wanted. Talleyrand had spent months trying to engineer the downfall of Murat. Now there would be no opposition to his forced abdication. On March 15, only ten days after sending assurances of loyalty to the governments of Austria and Great Britain, Murat launched an invasion of the Papal States. Murat met with only token resistance. On April 2, after a clash with Austrian troops, Murat seized Bologna. This was an overt act of war. He justified this act by sending a letter to Metternich describing his actions as a "precautionary measure" to guarantee order in central and southern Italy. (34) On April 10, Austria declared war on Naples. Murat was defeated and on May 20, surrendered his throne. Austria signed a new treaty with Naples. Ferdinand IV, the legitimate sovereign, was returned to the throne. Talleyrand was elated. He later wrote that this event,"consecrates anew, by striking example, the principle of legitimacy. And besides, it is useful to France, because it gave it, as an ally in Italy, the most powerful state of that country. "(35) France had not achieved the restoration of legitimacy in Naples, that had been done by Austria, but Talleyrand was satisfied. As for the rest of Italy, Talleyrand could exert only a minor influence. He managed to convince the powers that each Italian problem should be dealt with on its own merits. Talleyrand also convinced them that it would be counter productive to the balance of power to honor Papal claims to former French holdings. (36) Talleyrand also opposed the granting of any Italian territory to the Bonapartes. The Treaty of Fontainebleau had accorded the Duchy of Parma to Marie Louise, the former French empress, and rights of succession to her son. Talleyrand joined with Labrador of Spain in contesting this settlement and advancing the claims of the Infante Don Louis and his mother the Queen of Etruria. The Italian settlement, for all practical purposes, called an end to the business of the Congress. The Final Act of the Congress was signed on June 9, but before the settlements could be imposed on Europe, there was a battle to be won. On March 25, Austria, Prussia, England and Russia had signed a new alliance. This Quadruple Alliance renewed the Treaty of Chaumont. This time France was invited to join as a signatory. By luck or fate, France was now pledged to fight until Napoleon was crushed once and for all. The allied armies had gathered in Belgium and the Netherlands and on June 18, Napoleon met his final defeat at Waterloo. A new treaty with France would now have to be negotiated. The second Peace of Paris took longer to draw up than the first. This treaty was not quite as lenient as the first. France would be obliged to return to their proper owners all art treasures that Napoleon had claimed as spoils of victory. France would be restored to its 1790 borders. She would be required to pay a settlement of 700 million francs and support an occupying army of Allied troops for 5 years. This army would consist of 150 thousand men. Talleyrand opposed this treaty. He argued that the battles in 1815 had been against Napoleon alone. Louis had not given up the throne, and France had been part of the Alliance to defeat Napoleon, therefore no new treaty was needed. Europe wanted guarantees that the revolutionary spirit in France had been subdued and that there would be no further aggression. Talleyrand tried to convince them that Louis' very presence on the throne and France's signing of the Alliance treaty of March 25th should be guarantee enough. The Allies persisted in their demands and Louis' resolve weakened. By the end of September 1815, Louis was willing to accept the new treaty. This, in Talleyrand's opinion, undermined everything that had been accomplished at Vienna. Talleyrand refused to sign anything that would compromise France or render it powerless. Talleyrand would not be a party to something he believed to be detrimental to France. So on September 24, 1815, he resigned. Talleyrand was skilled in the art of manipulation, yet the evidence would suggest that he was motivated by a love for France and genuine concern for its welfare. During the Congress of Vienna, Talleyrand had championed the cause of legitimacy and justice. He had done everything in his power to raise France from the position of a defeated, second class power to one of equality with the Great European powers. When judged by modern standards his methods seem unethical and corrupt, but taken in the context of the era in which he lived, Talleyrand was typical of the politician of this period. until it was too late to remedy. articles , he had not signed them. protect their interests. He does not name who he met with. Bernard, J.F. Talleyrand: A Biography New York: G.P.Putnam & Sons, 1973.
Cooper, Duff Talleyrand California: Stanford University Press, Reissued 1967.